By Vicki Stephens, a certified trainer of therapy animals and operator of the pet therapy organization, Pets Helping People. Vicki guest blogs for pet insurance provider, Pets Best. 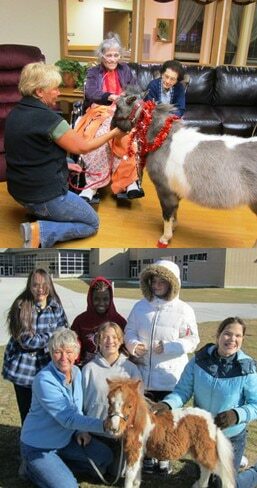 For the last 18 years I have been volunteering with my pet therapy animals. We visit nursing homes, reading programs at schools, assisted living centers and youth disability facilities. Currently I have three certified therapy dogs: Cooper, JP, and Tag (short for Tag A Long). As well as five certified therapy miniature horses: Malibu, Peek a Boo, Bell, Bo and Princess. All the horses are under 30 inches tall, except for Princess who stands at 31 ½ inches tall. And in case you are wondering, yes, they are all house broken! One of my former therapy dogs was a Toy Fox Terrier named Spunky. Spunky and I probably logged in more than 200 hours visiting nursing homes. I remember one lady in particular during these visits. She was a sweet tiny little lady. Every time we walked into the nursing home she would call out, “There’s my Spunky!” I had been told she had dementia, so I was puzzled how she could remember Spunky’s name, yet not remember her own family member’s names when they visited her. Later, I learned from her family that when she was a child, she’d had a Toy Fox Terrier who looked very similar to Spunky. Just seeing Spunky sparked something in her mind that brought her back to her childhood days. The nurses told me they loved when Spunky visited her. They said after the visit, she would spend the rest of her day telling everyone about her childhood dog. Apparently she would even finish her evening meal, which was rare for her. Therapy animals are effective in helping the elderly who suffer from depression, feelings of isolation, anxiety and other psychological issues. It’s amazing how the benefits of pet therapy present themselves in so many different ways. For instance how Spunky allowed the lady to remember happy childhood days, and helped work up an appetite! Pet therapy is a healing process. It doesn’t matter if it’s an 85-year-old nursing home resident or a young child. You’re helping people heal physically, spiritually, and emotionally. Pets improve our health, so why not protect their health with pet insurance? Pets Best Insurance provides dog insurance and cat insurance plans that reimburse from up to 100% of each veterinarian bill!